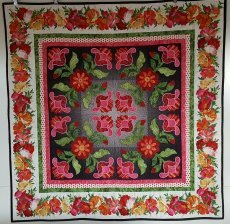 Start with the original pattern "Pretty Posies" by Jane Spolar, some beautiful Northcott fabric and some delightful digitizing by Carol Mancuso and you have infinite possibilities! Carol will show you how to embroider the blocks and put them together with embroidered files. Make a 46" x 46" square version to use as a wall hanging or table topper using an embroidery machine to applique. Make a 28" x 60" rectangular version to use as a large table runner or a bed runner from the original pattern, with a twist .....Embroidered. 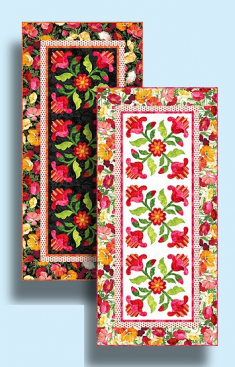 Embroidered Quilts, table-runner & wall-hangings. 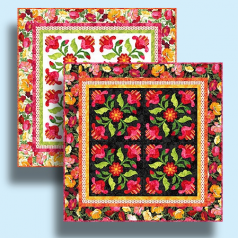 Embroidered Quilt blocks on Hoffman Digital Supernova backgrounds. Northcott fabric borders will knock this out of the park! Hoffman Supernova background fabric and Northcott Fabric for the applique and borders. 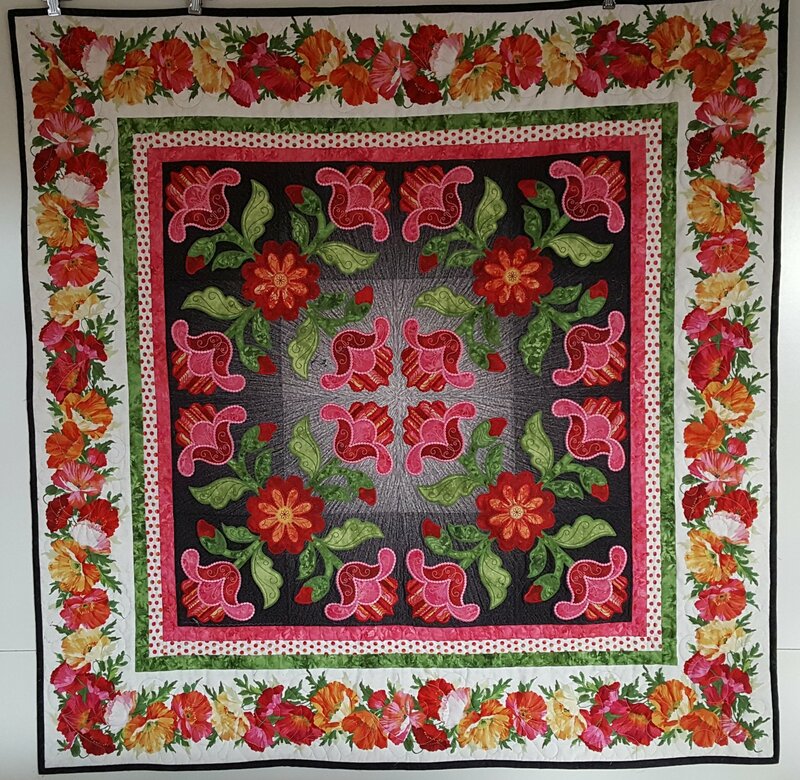 What a WONDERFUL table-runner or wall-hanging. The pattern and embroidery files can be picked up as early as Wednesday before the Friday class. We will be starting on the embroidered block. Students need to pick fabric and thread for the center of the quilt. The sample uses the supernova fabric for the background, but feel free to pick what suits you. Consult the pattern for yardage..
Come ready to embroider. The blocks fit in a 200 x 200 hoop or larger. Tear away stabilizer will be fine and you'll definitely need either soft fuse or steam a seam for the applique. Bring the usual sewing tools. In addition, fabric glue stick and duckbill applique scissors are also recommended. Requirements: Advanced Sign-up Required Original Pattern & Digitized Files are included with the class sign-up fee. Home | Class Info | News & Sign Up | About Us | Contact Us | Shop!